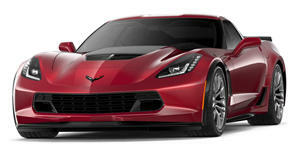 Only 650 models will be produced to commemorate the Corvette's 65th anniversary. As one of the most enduring and seminal American sports cars of all time, the Corvette may be about to hit the grand old age of 65, but it’s showing no signs of retiring any time soon. To commemorate its 65th anniversary, Chevrolet has revealed a new Corvette Carbon 65 Edition package available for the 2018 Grand Sport 3LT and Z06 3LZ models. As you would expect for a special anniversary edition, the Corvette Carbon 65 Edition will be a highly exclusive model, with a mere 650 units planned for production worldwide. Setting the Corvette Carbon 65 Edition apart is a carbon fiber exterior package applied to the front and rear spoiler, side sills and quarter ducts, finished with a Ceramic Matrix Gray body color and gloss black wheels. Completing the exterior changes are unique fender stripes and door graphics and blue brake calipers. As for the interior, the cabin is wrapped in a jet black suede finish with a carbon-fiber-rimmed steering wheel and gloss carbon-fiber interior trim, as well as Competition Sport seats. All 2018 Corvettes will also receive a minor equipment upgrade, including HD radio as standard, an improved rear-view camera, an optional Performance Data Recorder and a Spice Red convertible top option. A ceramic brake package will also be available for the Grand Sport without the Z07 Performance Package. “Corvette is one of the most storied names in Chevrolet and sports car history, with a heritage few can match,” said Chervolet's Paul Edwards. “The new Carbon 65 Edition honors that legacy, while offering customers another unique, special-edition model that personalizes the ownership experience.” The Corvette Carbon 65 Edition will be available this summer for $15,000 with the rest of the 2018 Corvette lineup. At least it closely coincides with the Corvette’s anniversary, unlike the Nissan 370Z Heritage Edition arriving two years before the 50th anniversary of the original Z Car, bizarrely.